The Western New York Book Arts Center presents Through A Dirty Window, an exhibition by Joseph Scheer on view from May 14th-June 26th, 2015. Scheer is a multidisciplinary artist who has exhibited both locally and internationally, and is currently teaching at Alfred University where he cofounded the Institute for Electronic Arts. Using extreme resolution, focus and enlargements through scanning and HD Video, Scheer creates immensely detailed photographs of ordinary objects (cacti, tricycles, caterpillars) turned extraordinarily eye-catching by his sensitivity to the slightest of details. By displaying such images in laser-etched and hand-crafted loose boxed books, Scheer invites his viewer to interact with each unbound page, creating an intimate study of nature only viewable by his use of technology & process. Through A Dirty Window will open in conjunction with LitTAP, A NYSCA funded networking and professional development event for literary artists and educators held annually. 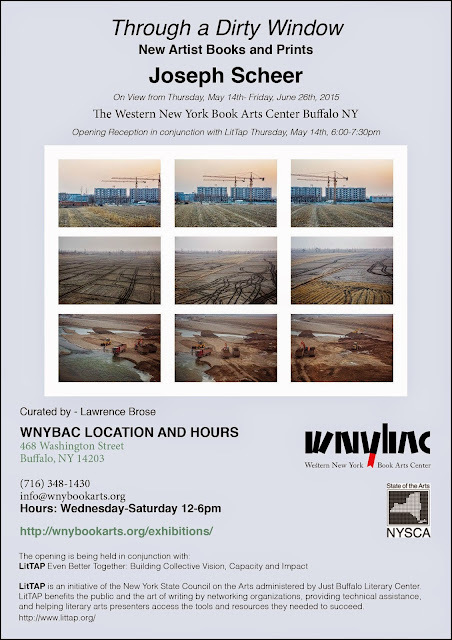 This year Just Buffalo Literary Center, WNYBAC’s upstairs neighbor, is hosting the event with the help of WNYBAC, to provide a fantastic gathering of all things book arts! Scheer’s show is the third in the 5 x 12 series at WNYBAC, a NYSCA-funded yearlong residency program which features 5 artists over the course of twelve months. Gallery hours are 12-6pm,Wednesday-Saturday. Admission to the gallery is always free.